During the first three weeks of hiking I have hit a lot of highs and a lot of lows. It’s been extremely emotionally and physically demanding. I’m realizing that a lot of the preparation I did before the trip is actually making my hiking adventure more difficult instead of easier as I had intended and hoped. I’ll get into that a little later though, maybe in my next update. This update is going to be less of an update and more focused on sharing the process of making one of the most difficult decisions that I have had to make so far, and likely will have to make over the duration of the entire hike. 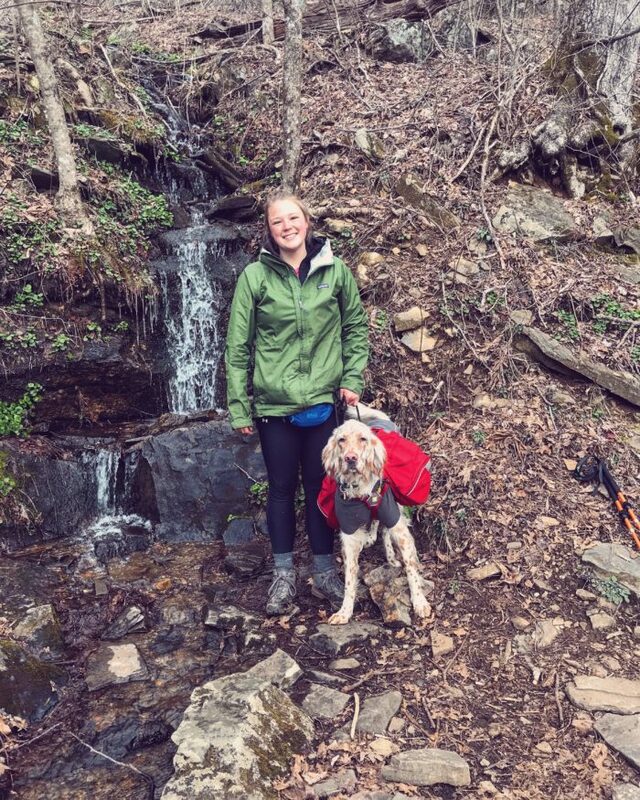 Yesterday when I hit Fontana Dam, the start of Great Smoky Mountain National Park, I decided that instead of kenneling Flynn for a week during the non-dog friendly section of the Appalachian Trail, that I was going to send him back home to Maine to stay with my grandparents indefinitely. This has been a long and seriously thought-out decision. For my own feelings of guilt, and the need to process the decision further somehow, I wanted to take the time to explain to everyone else how I came to this super-tough and painful choice. I thought that maybe if someone else was stuck trying to make a similar decision during their hike, that I could try to make it a tiny bit easier on them and let them know they aren’t the only one to have to make this crappy choice. Flynn is a part of my identity in my real life, and he’s especially a part of my identity here on the trail. 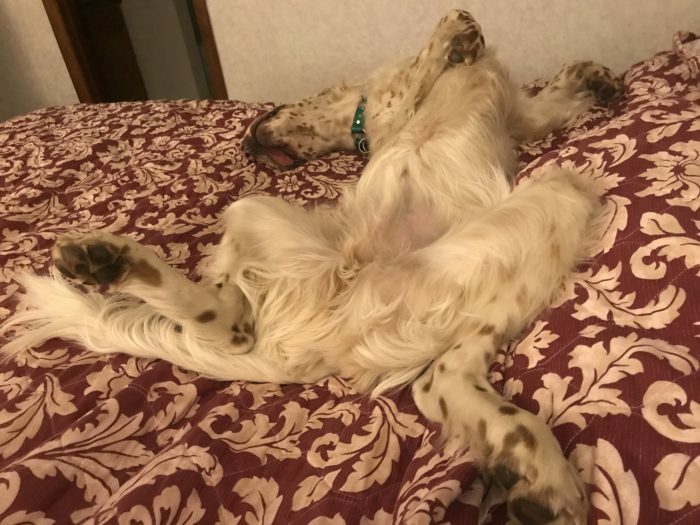 Everyone knows and loves his goofy sleeping positions at the end of each day. Plus he is excellent at eating the leftover instant mashed potatoes that everyone makes for dinner each night. 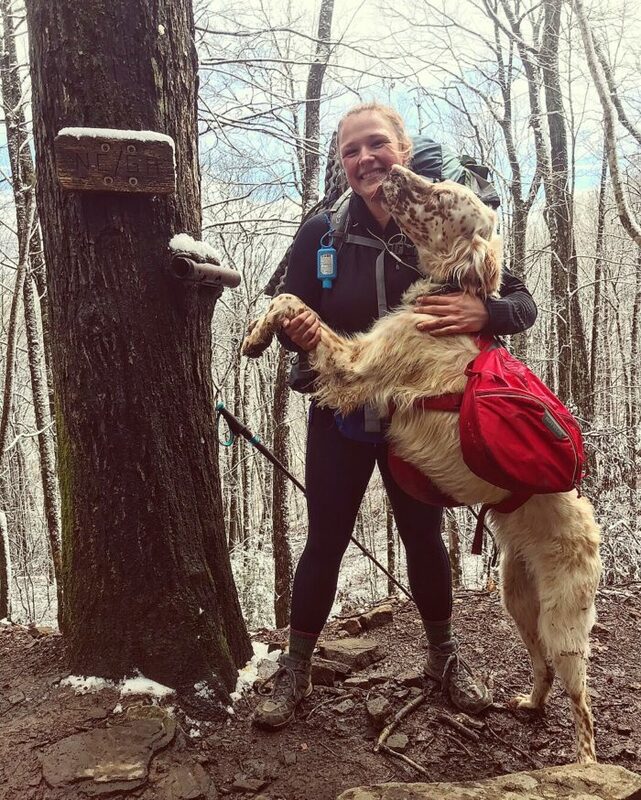 Having a dog makes you a pretty popular person on the trail; everyone takes the time to come talk to you in order to get some dog snuggles. This choice hurts. I love this dog. Flynn is my best friend. 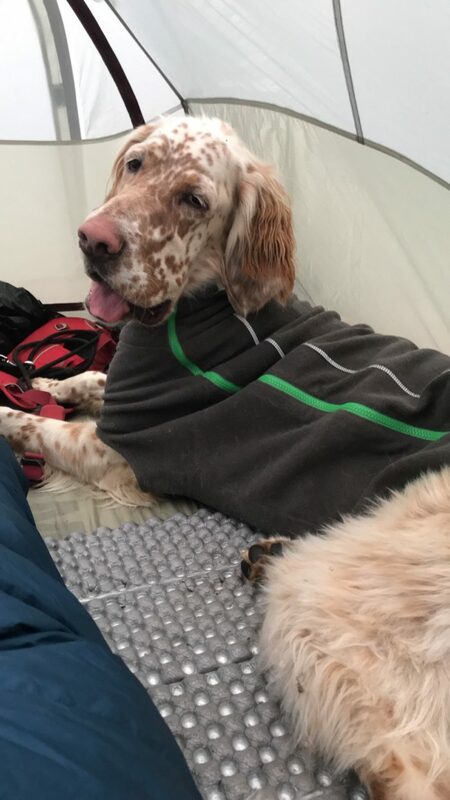 He keeps me company on trail and he helps me feel more safe alone in my tent every night. We have been together since he was eight weeks old. I raised him, gave him love and attention, took him to puppy training classes, socialized him; he’s my passenger seat pal, he’s my running buddy, and he makes up the majority of photos on my phone. When I have felt sad or alone, he has always been there with his giant, warm brown eyes, reminding me that everything will be OK. We won’t be together to celebrate his first birthday, and it completely breaks my heart. I wanted this to be our adventure together, I wanted this trip to strengthen our bond of loyalty and friendship. Unfortunately, as much as I hate to say it, the last three weeks have not been those things. The technical factors in making the decision. Weather: Keeping myself, my gear, Flynn, and Flynn’s gear dry and organized is a lot of work. When I fail to keep him dry, to keep his gear clean and well cared for, I feel stressed. It makes me feel like a bad pet owner and I hate to see my best friend cold, wet, and miserable. Added weight: Honestly, this part is basically irrelevant to me. I don’t mind the extra weight in my backpack as long as having him with me is bringing me joy. Cost: Pet-friendly accommodations cost more. They limit the places I can go and the things that I can do. Again, this aspect doesn’t matter much to me either as long as having Flynn improves my hiking experience and brings me happiness. Flynn’s behavior and hiking manners. If you haven’t had the delight of meeting Flynn, then you haven’t heard his talented singing voice, and his terrifying (and excruciatingly loud) screaming voice. It can be funny and very charming to hear his grumbles; they are almost conversational at times, but they aren’t always enjoyable. His vocal noises are not solved by scolding, and they are certainly not solved by ignoring. Increasingly over the past three weeks he has become more and more vocal around camp and when I try to take breaks while hiking. When you are climbing up steep mountains and you want a second to catch a breath, it’s extremely unpleasant to have high-pitched screaming in the background. It’s also pretty rude when your campsite neighbor is cooking dinner and your dog won’t stop howling and staring in their direction while you’re trying to set up your tent and get settled in for the night. Solving this problem is doable, but in the environment that we have been in, it is super difficult due to a few things like exhaustion, frustration, and other hikers unknowingly rewarding bad behavior. I’ll touch more on that a little later. Lack of maturity and training. Flynn just turned 11 months. He is a baby and it’s unfair to expect him to act like anything but that. I was most worried about whether he could physically hike this trail, which in the first three weeks, he proved was not a concern at all. Physically, he’s in a great place to go on this adventure with me. It’s the immaturity that’s limiting him in this case. If Flynn was a three-year-old dog I think he would do incredible out here hiking. We did training before we left, but I think I needed to do more and do it for a longer period of time before coming out here and expecting him to act perfectly. That is my fault completely, and I will take full responsibility for all the bad behaviors Flynn has been displaying that have played a role in my decision to take him off the trail. Some of these problems that we’ve had could be solved if Flynn could be trusted off leash, but he’s not at a point in his training that he can be. Flynn likes to wander where his nose takes him, he loves to greet new people, and he likes to run, romp around, and wrestle. Those are all normal puppy behaviors, but it makes for letting him off leash not much of an option. The issues we are facing on the leash make for some frustrating hiking. Flynn has a complete lack of realization that we are physically attached at the hip. Literally, his leash is attached to the hip belt of my backpack. During our hike into Fontana, Flynn leaped in front of me and both accidentally and unknowingly yanked me down a pile of icy rocks. I know it was not on purpose, but I have a giant swollen bruise and a scrape on my hip. This was the first time he actually knocked me down, but it has been a close call several times before. I’m afraid that I’m going to get more seriously hurt the next time. I hate to think that Flynn could accidentally cause me to have a more-serious injury, one that could have the potential to force me off the trail. Flynn also loves to lead the way, but due to the fact that he loves dragging me, and he enjoys barking to greet other hikers in front of us, he is forced to walk behind me. That was something I hadn’t expected; in all of our training, we always hiked alone. It was an issue that hadn’t even been on my radar. While walking behind me, he tries to walk real close, frequently stepping on my feet, constantly tripping me, and often placing his paw right on my trekking pole. In the mornings he is just such a ball of excited energy that he is insistent on trying to run past me, which slows down the hiking and constantly keeps me on edge, feeling frustrated that that he may run past me in difficult terrain, and get both of us hurt. Training him to walk behind me while hiking long days over rocks, and slippery roots is really difficult. It feels like I’m using all my energy to constantly correct him and it makes me exhausted and grumpy, which doesn’t help either of us. Maybe some folks can do it, but right now I feel like I am unable to to hike my hike and train Flynn simultaneously. 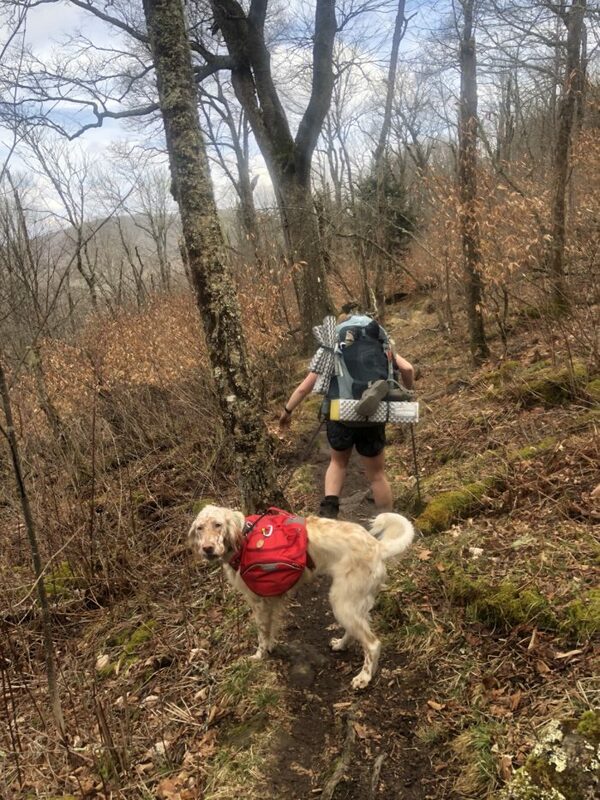 Speaking of training, I touched on it earlier, but other hikers are constantly rewarding bad behavior unknowingly and it makes the problem worse. When he screams at camp and someone talks to him, and then walks over to give him a piece of beef jerky, it teaches him to continue the bad behavior. When Flynn is barking and trying to drag me to greet the hikers ahead and they come walking in his direction, bent over, and ready to pat him, they are rewarding his bad behavior. With all of this reinforcement the behaviors are getting more constant and harder to shake. These behaviors are making me constantly frustrated with him, and it’s unfair and straining on our friendship. Flynn is such a good dog; he is friendly, gentle, incredible with children, he has never had an issue with another dog, and he doesn’t deserve me being irritated with him constantly. Besides my own guilt and feeling like I’m not caring for him well enough, Flynn is a couch dog. He loves to sleep all day. Making him hike to exhaustion each day with no time to play and scolding him for wanting to wrestle with the leash and play while hiking up and down sketchy terrain feels cruel. At home we play fetch and out here on trail, right now, I’m too tired to play. He does what I ask of him all day, he hikes however many miles that I ask of him, and then when he rests for a while and finds the energy to play. But right now, I’m exhausted and I don’t want to play. I’m the bad guy here, not Flynn. The highlights of our time together. Don’t get me wrong, Flynny and I have had an incredible time out here together. We have had some wonderful moments, memories, and bonding experiences the past three weeks. He’s been such a trooper, and I am so glad that I got to start my hike with my best friend. We passed our first state line together. We enjoyed some comfy hotel beds together. We climbed some major mountains and enjoyed the views together. We spent several nights huddled up in the cold together, exhausted and enjoying the quiet privacy of our tent. We posed next to cool mini-waterfalls together. 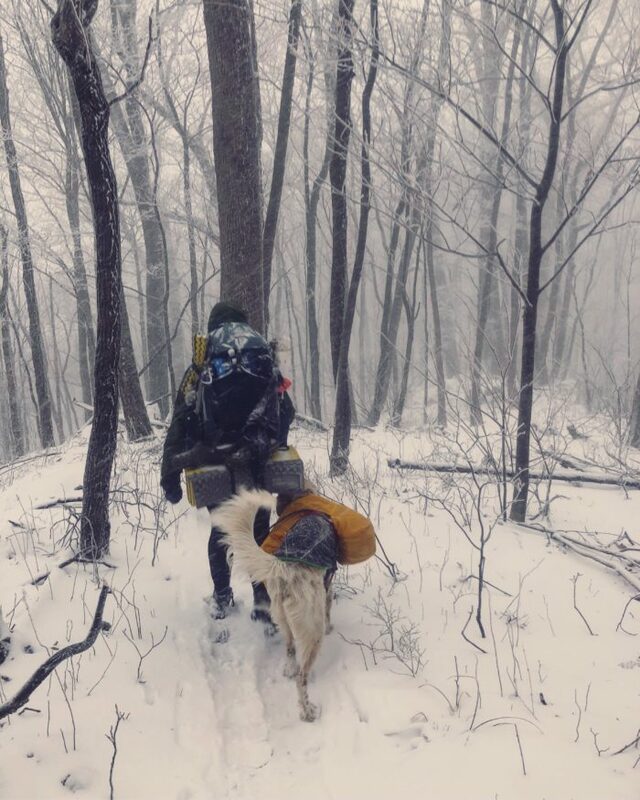 We hiked in the snow together. We hiked in the sunshine together. We hiked in the rain together. 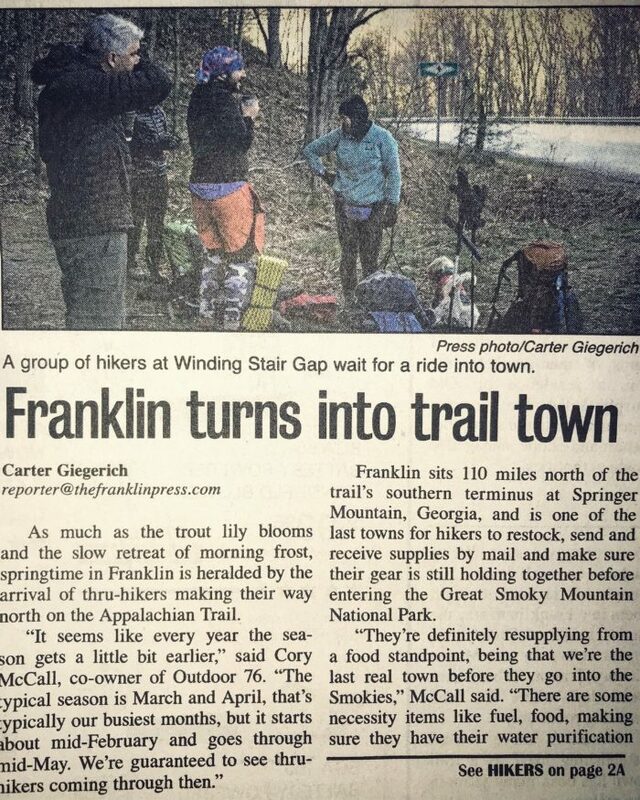 We even made it into a local newspaper together. The truth is that I am out here alone now. I no longer have the stability and support of my best friend. I’m going to be sad, and I’m going to miss home. But I have a great trail family started already, and I am going to lean on the new friends that I have made out here to help me through this. Maybe it seems dumb. After all, he is just a dog. 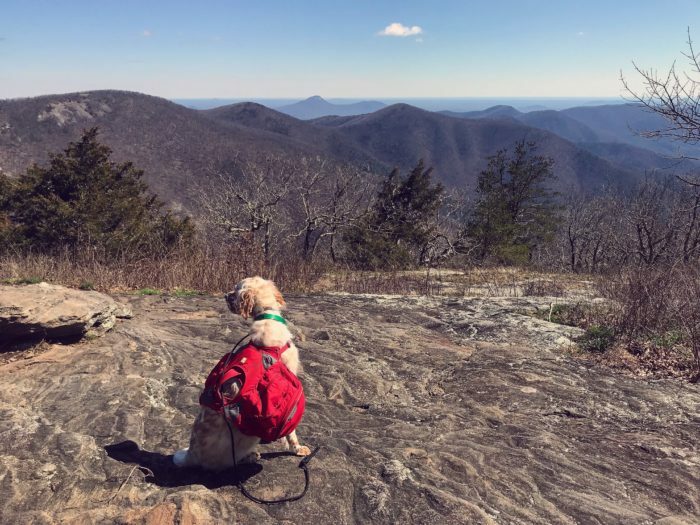 I mean, several hikers leave their dogs at home to hike the trail, but it makes my stomach twist and my heart heavy when I think about not being with him every day like I have since he was eight weeks old. It makes me sad thinking that he won’t see me for five months. What if he thinks that I abandoned him? I mean, maybe I sort of have, but I really do feel that this is the best decision for the both of us. Not having Flynn hiking with me is going to dramatically change my hike already, but I am planning on making some additional changes as well. While Flynn is (hopefully) happily snoozing on the couch with the family, and playing with the other pups back home, I can spend more time noticing my surroundings, taking more photos, being more mindful and in the moment, and making more valuable memories with the energy I won’t be spending trying to scold and control Flynn and his wild puppy energy. I know that having a dog has provided many of my friends and family with a sense of comfort, and I just want to take a second to tell you not to worry about me. I will be OK out here, I swear. I’ve made some great friends already and I’m getting more experienced every day that I spend on the trail. I love you and miss you all. I’m still keeping my fingers crossed that Flynn can guest star for a few days here and there along the way, especially when I get a little closer to Maine. 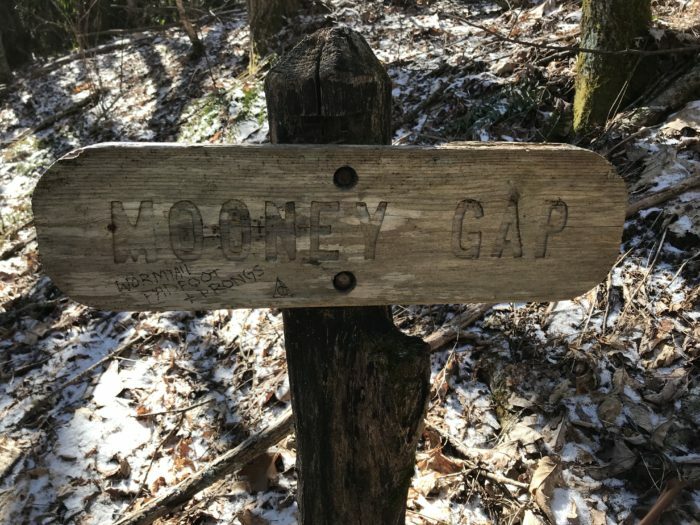 One more little note: I know a lot of the Mooney family has been reading along with my blog and following the journey and I hiked past a sign that made me think of you all. Thank you guys for being so wonderful! Hi there! 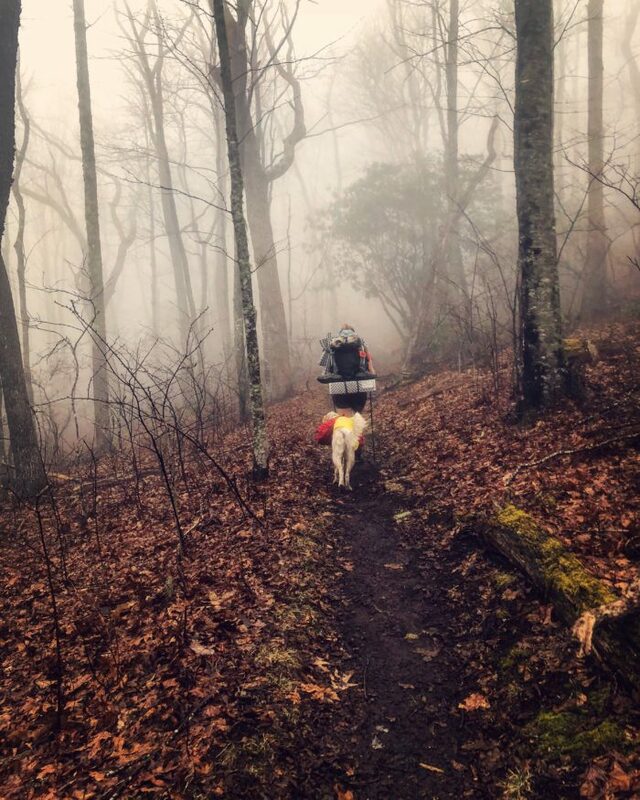 My name is Dayze and I am a 2018 Appalachian Trail thru-hiker with my dog Flynn! We will be walking our way from Georgia all the way back home to Maine starting March 1st! After that we will hopefully be continuing on to veterinary school. Flynn and I like long naps on the couch, any and all breakfast foods, old worn sneakers, cows, peanut butter, and of course mountain views! Bless ya, it’s hard isn’t it finding the happy medium for you both? As hard as its going to be for you I think you’re making the right decision for you both. You need to concentrate on your hike and Flynn needs the ‘puppy’ attention, training, you cant give both right now, don’t worry he wont forget you!! You’re both going to change and grow you complete you hike and Flynn as he becomes a teenager!! And you’ll both be better for it when you reconnect! Keep blogging and giving updates on Flynn too! Your making a decision that’s right for you at this moment! It took me a long time to teach my tiny red mutt to listen and not bark on our hikes but she’s two now and does great! Flynn will get there…he’s adorable. He’s got a lot of learning yet to do but he’ll get there. Stay safe out there and reach out once your in Nelson for real if you want! Thank you for sharing your anguish with this decision in such detail. I am grand dog sitting my daughter’s dog while she & her companion do their 1st AT hike NOBO and this really highlighted the depth of your love & care for your best friend as I know she struggled with leaving hers too. Your instincts & intentions will have Flynn back at your side when you are both ready! Looking forward to following your adventures & seeing a great reunion picture in Maine!! I am currently driving from Damascus back to Wisconsin to take my pup home and return to the trail in a 36 hr turn over. I can say I know how you feel. I’ve been in tears since this morning when I rented the car. It’s a hard choice but at the end of the day, only we know what is best for each of us. I hope you find solace in knowing Flynn got to hike a cool hike and doesn’t care about a thru hike title, only the awesome moments shared. My thoughts from trail mile 470. Keep up the awesome work! !